EPA requirements are designed to ensure that all work done on Lead Abatement Projects, whether interior or exterior surfaces, is done to the highest level of safety and risk management. Containment of the generated airborne and wastewater dust and debris is critical to proper compliance and worker safety. Improperly contained dust and debris is not only a EPA violations, but it can be very harmful for the environment, on-site workers and the occupants of neighboring areas. Negative pressure containment is a requirement for capturing airborne lead and other fine dust particles that are inevitably a part of Lead Abatement Projects. Ensuring your contained area has the required air changes (ACH) and that it is adequately scrubbed prior to discharge is where you will find the OmniAire line of HEPA Air Filtration Machines a competitive advantage. With standard airflows ranging from 50 to 18000 CFM, OmniAire Air Filtration Machines can provide the necessary ACH for any size project. To calculate which of our machines will best suit your needs, try our Air Flow Calculator in both SAE and Metric. Following EPA regulations by maintaining adequate pressure containment, air changes, and HEPA efficiency is important to the quality of your overall project. 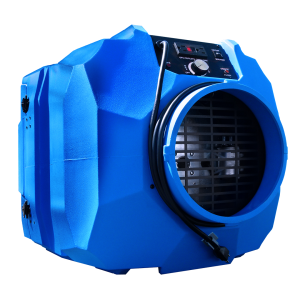 Flexible Placement – Our OmniAire HEPA Negative Air Machines can be located either inside or outside the containment area, which allows you to exhaust the HEPA purified air either into or out of the specified area. 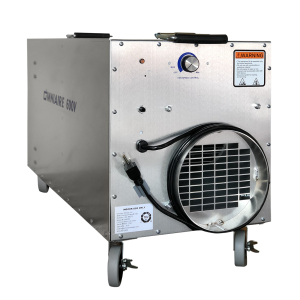 Variable CFM Control – OmniAire machines are available with airflows ranging from 50 to 18000 cfm and many of our models offer a variable speed control to allow for an infinite array of airflow settings. Economical HEPA Filters – Our HEPA filters are designed to provide an exceptional service life before replacements are needed. With a standard 12” deep 99.97%, 0.3 micron HEPA filter, and an optional 99.99%, 0.3 micron (individually tested and certified) HEPA filter, we can meet your HEPA air filtration needs. Operating Safety Standards – OmniAire Air Filtration Machines meets the UL, CSA and OSHA safety standards required on governmental projects, in healthcare facilities and on job sites where employee safety is of concern. In addition, a number of our models meet CE/IEC regulations and requirements for export. Built for Durability and Reliability – All of our OmniAire machines are built to perform in tough construction environments. They are designed to be easy to maintain and to meet the DOP efficiency testing needs of your project. For assistance in choosing the correct OmniAire HEPA negative air machine for your asbestos abatement project use our handy Airflow Calculator. When using negative pressure containment, it is important to monitor the pressure inside the containment in reference to the outside area. 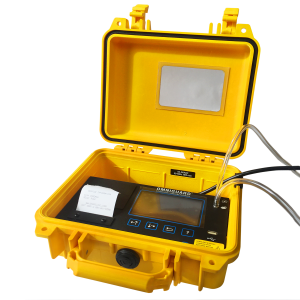 However, because the typical negative pressure required can be as low as 0.020”WC, it can be difficult to find equipment sensitive enough to measure and monitor your containment area. Omnitec Design has a monitor to meet this need. The self-contained Omniguard 5 Pressure Recorder is designed to provide an accurate monitoring and alarming functions while still being easy to setup with a simple push-button calibration. The water used to wet surfaces and wash protective gear during lead abatement work is contaminated and must be filtered prior to discharge into a general drain. The OmniFlow Water Filtration System is a compact, portable system with a 3 GPM capacity and reliable, self priming pump. 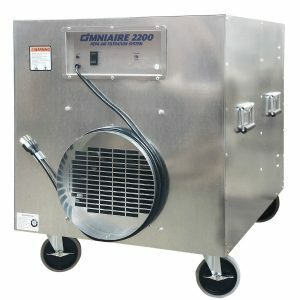 The unit has as standard 20 and 5 micron filters for removal of asbestos and lead dust. Other filters are available for lead when required. 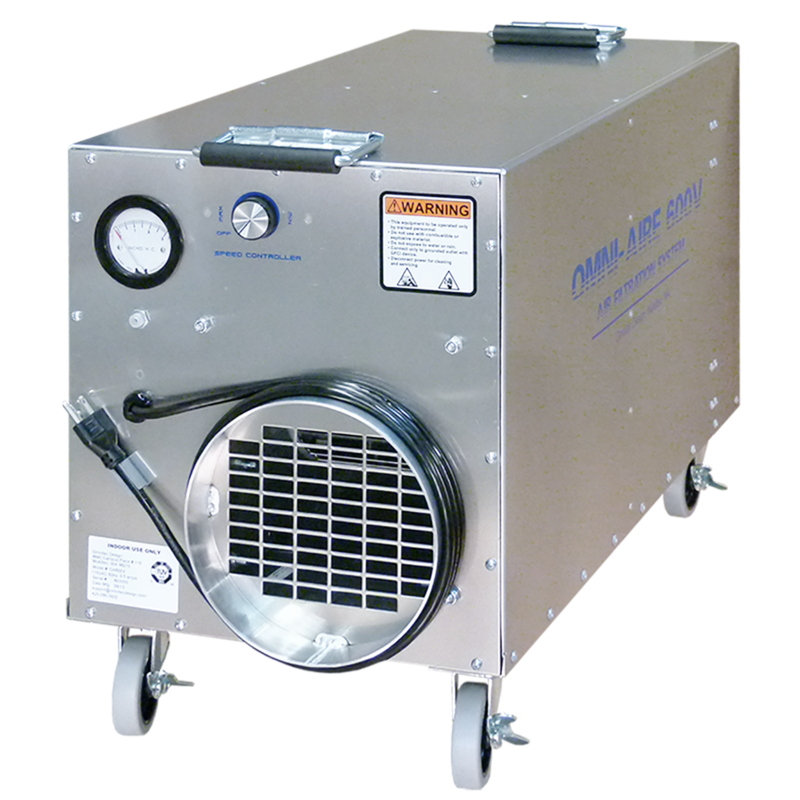 OmniAire HEPA Air Filtration Systems are used as air scrubbers and negative air machines on all types of abatement projects. They have a reputation for quality construction, reliable service and are often used on projects where DOP efficiency or equivalent tests are required before the equipment is used. 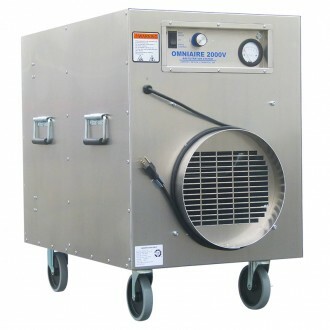 OmniAire HEPA negative air machines are sold throughout the USA and Canada and are exported worldwide. To assure our product electrical safety, machines are tested by TUV Laboratories to comply with UL and CSA/IEC safety requirements. As mold abatement projects vary in size, accessibility and types of contaminants, the size of the equipment has to be considered. 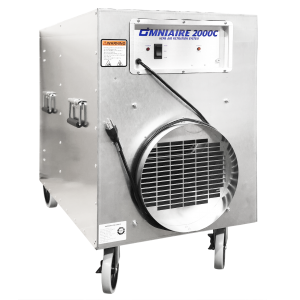 OmniAire HEPA negative air machines come in many sizes and configurations. To accommodate the variations of the required air flow, our variable speed controller is standard on most of our equipment. Why is a negative pressure containment used? How much airflow I need?